The Roma was the first airship/dirigible purchased by the United States. 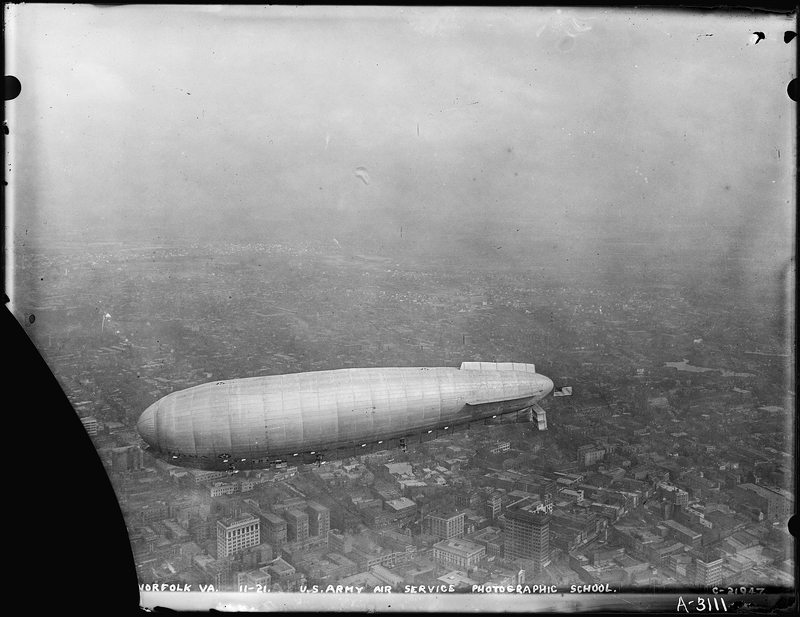 The US at the time was very interested in capitalizing on the military possibilities of lighter-than-air reconnaissance and tactical pursuits as a result of balloons used in WWI and successful use of Zeppelins by Germany. Originally designated the T-34, the Roma was purchased by the United States from the Italian government in 1921 for $250,000. Very worthwhile book about the Roma! I am happy to include a link here (click on the book image above) for a new book on the Roma by Nancy Sheppard. 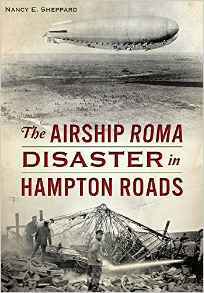 I found this to be a wonderful account of the airship's history and the disaster, worthy to be on the bookshelves of every American, certainly of everyone with any interest in the history of aviation! It's available in paperback and for the Kindle. Get it, and enjoy! She really brought the Roma alive! 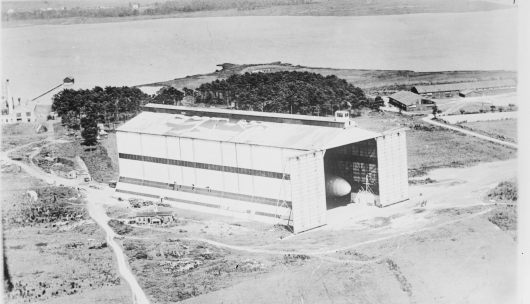 The Roma as she looked in the skies during her brief lifetime over the Norfolk, Hampton, and Langley AFB, Virginia area in late 1921, early 1922. 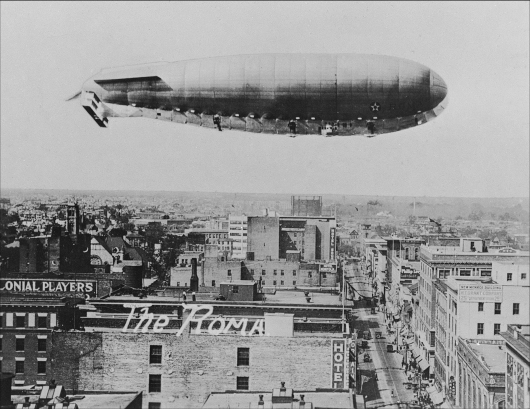 The Roma was an Italian-built airship purchased by the United States in 1921. The Roma was a semi-rigid airship designed (believe it or not) for trans-Atlantic crossings! 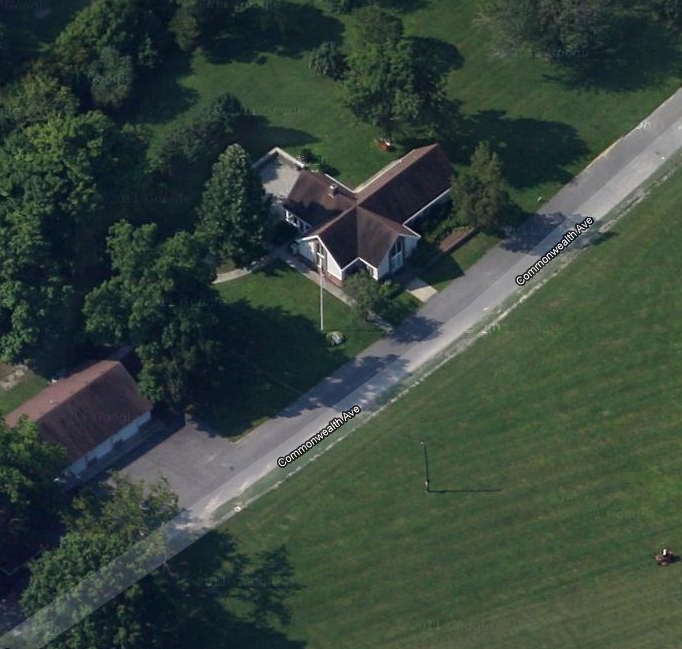 She was built in 1920, in Italy, and her first flight was in September of that year. She was the largest semi-rigid airship of the day at 410 ft long, and 83 ft in diameter. She had a top speed of 80 mph with a cruising speed of 56 mph and a range of 3,000 miles. Upon first flight, the cabin was capable of carrying 25 passengers, but upon successful operations, plans called for modification to the cabin to increase the passenger capacity to 100! The Roma made a series of successful flights in Italy, and she was dismantled, boxed, and shipped to the US. 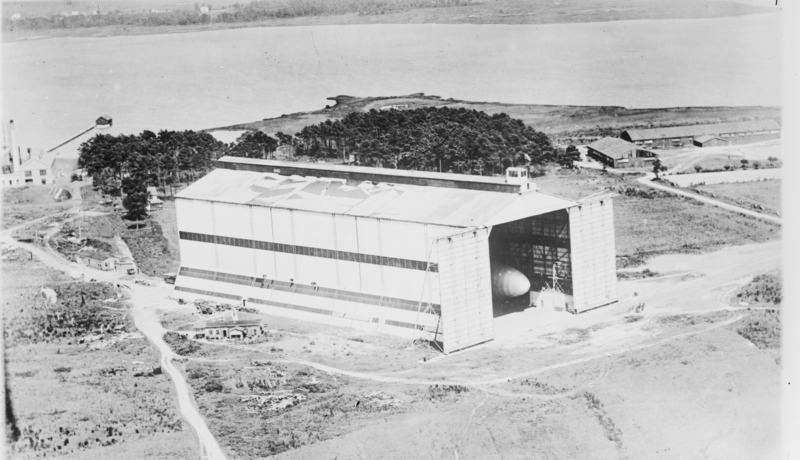 Upon reassembly at Langley Field, VA, she made her first flight on November 15th, 1921. It was apparently during that flight that the Ansaldo engines were determined to be unacceptable, and the Roma was soon taken out of service to replace her engines. The Roma’s first flight with the new Liberty engines was on February 21, 1922. Not much else can be said about the Roma’s “operations”, because this first flight with her new engines was her last. The Roma was making its test flight from Langley Field, to the Naval Air Station Norfolk with 45 passengers on board. (From August 1918 to July 1921, Naval Air Station Norfolk was known as “Naval Air Station Hampton Roads”, today it is the Naval Station Norfolk.) The Roma began making her way eastward to Chesapeake Bay, then turned south-southwest along the shoreline, toward Fort Monroe. 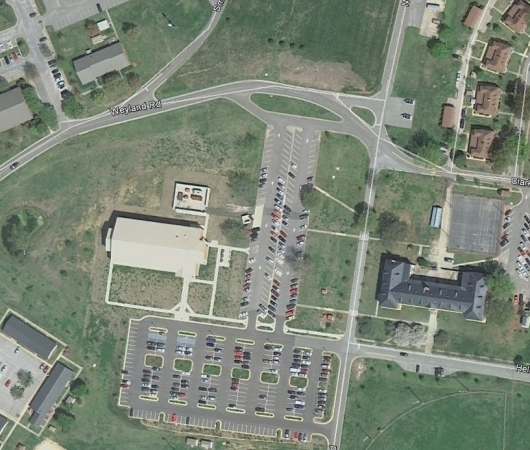 The crew surely waved at people below and at Fort Monroe where crowds likely gathered. The Roma headed out over the water toward Willoughby Spit (the peninsula which separates the Chesapeake Bay from tiny Willoughby Bay, crossed today by Interstate 64). 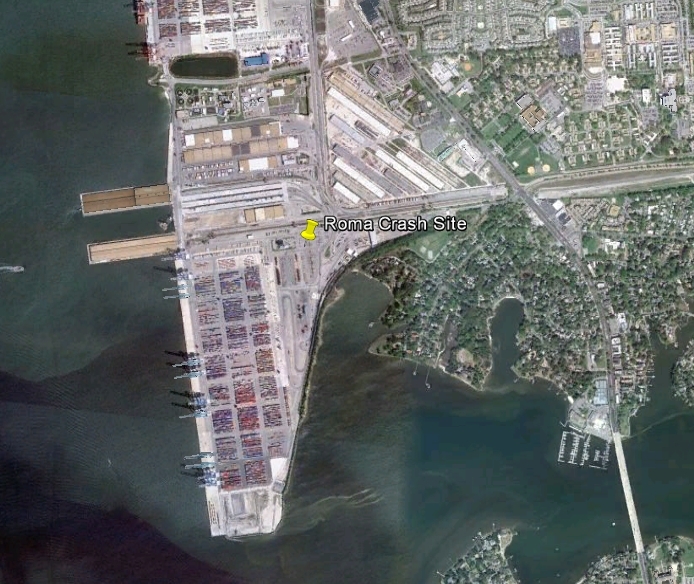 Cruising over Willoughby Bay, she headed on to the Norfolk Naval Station. At some point, crew-members noticed that the upper nose of the gas-bag was flattening, a sign of the loss of the lifting gas - hydrogen. The Roma, pitched her nose toward the ground. 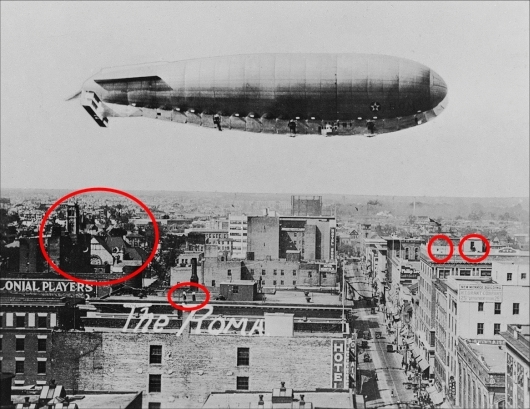 Accounts of what happened next vary as she was now over ground and many people witnessed the fatal moments, but the most likely description is this: It seems the airship became unmanageable when at an elevation of about 1500ft, observers below noticed the huge box rudder had come loose and was hanging at about 45 degrees. After her box rudder came loose, the Roma began rapidly descending. She cleared the chimney stacks of a few buildings but then became ensnared on high-tension wires resulting in a terrific explosion. 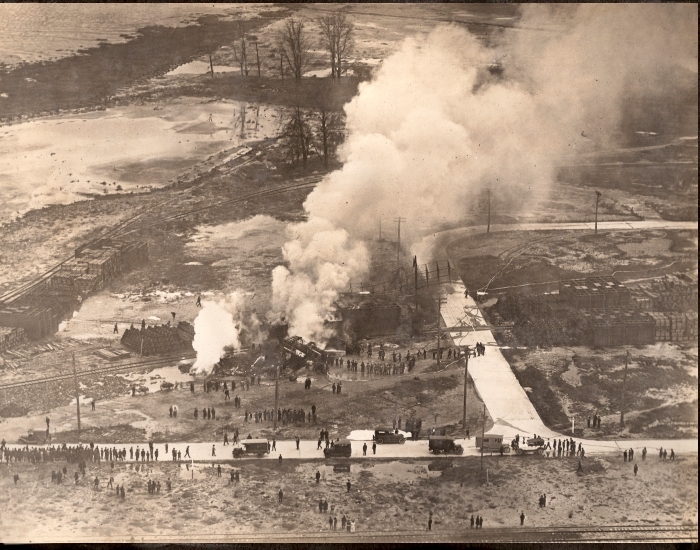 Thus the Roma crashed horrifically on that test flight on February 21, 1922. The crash was believed to be caused by failure of that distinctive box rudder, the failure of which, caused the Roma to nose-down. Being low to the ground, and despite the crew throwing out anything they could to lighten her load, she contacted the high voltage lines, and burst into flames. 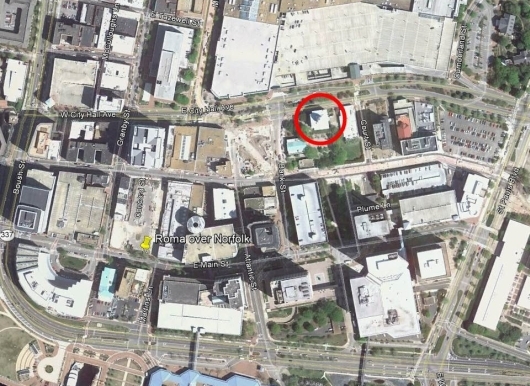 34 people were killed, 8 injured, and 3 escaped unharmed. 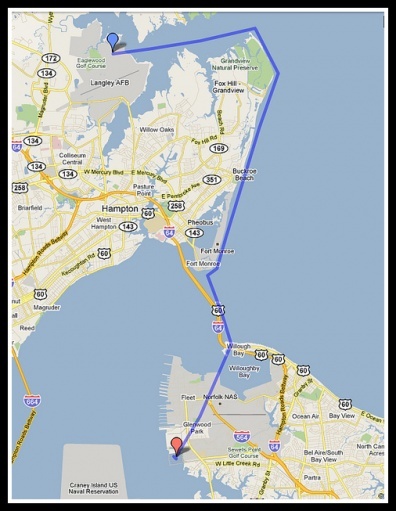 The event marked the greatest air disaster in the US to that time. Outrage at the crash and explosion and loss of life, all of which was just 6 months after the loss of the British R-38, which was to become the United States' first rigid airship, the "ZR-2", had crashed while on a trial flight in England, the US vowed never again to use hydrogen as the lifting gas in American airships. 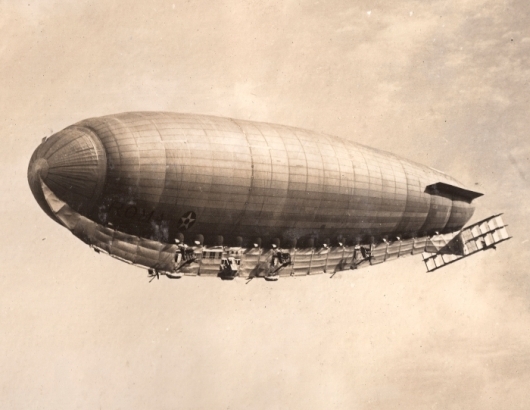 Nevertheless, even with helium instead of hydrogen, sadly, US Airships suffered more fatal accidents in the years following until the era of airships ended in 1937 after the dramatic explosion of the German LZ-129, the Hindenburg. The hangar location was verified by a 1942 map of Langley Field I managed to locate, which showed the position of the hanger approximately as I have portrayed it here. 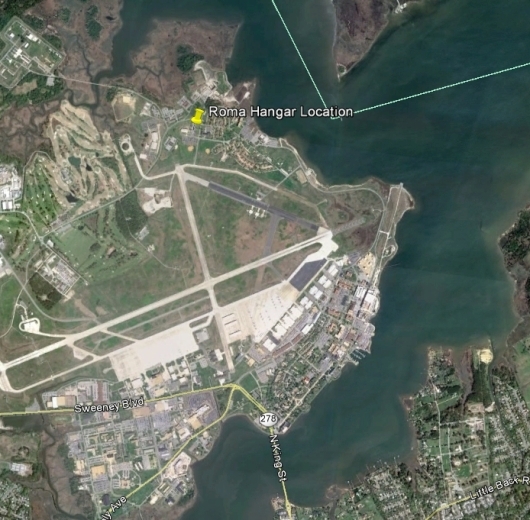 Though I have not gone so far as to try to locate the flight log of the Roma, there seems little doubt she passed over Norfolk, Virgina at least a couple of times. Here are two photos which I was able to locate the approximate position of the Roma by buildings in the photo which still exist today. This first photo is from a glass negative, and the scanned image is actually fairly large. 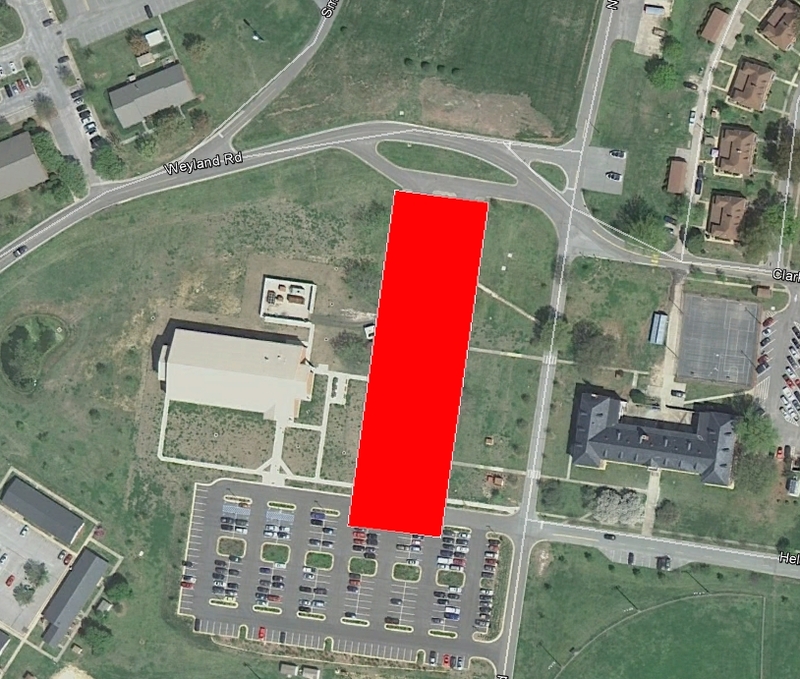 In this reduced version, one cannot readily see the detail, so if you are interested, right-click on the image and download the full-sized version. In this image, the Old Courthouse of Norfolk is visible, and it did not take me long to find the Old Courthouse and thus, the location of this photo. 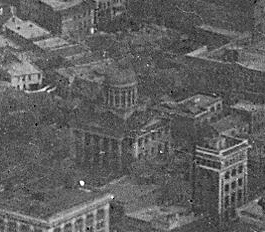 Based on the identity of the Old Courthouse, I've placed the approximate location of this photo to be at (Lat Lon) 36.846802 -076.291127. (Click here to View in Google Maps) Look down City Hall Ave, and you will see the Old Courthouse, now called the "MacArthur Memorial Museum". This is a terrific photo for several observations. 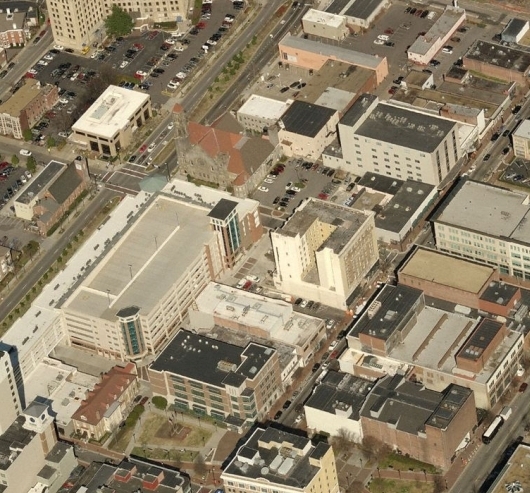 First, that street, prominent in the lower-right third of the image is Granby St. Next, there is a church in the image which allowed me to identify the location of this scene. And finally, there are just a few observers visible in the image which I find remarkable because airships were so rare, that I would think that if an airship were passing over, word would spread, and hundreds would be on the rooftops! 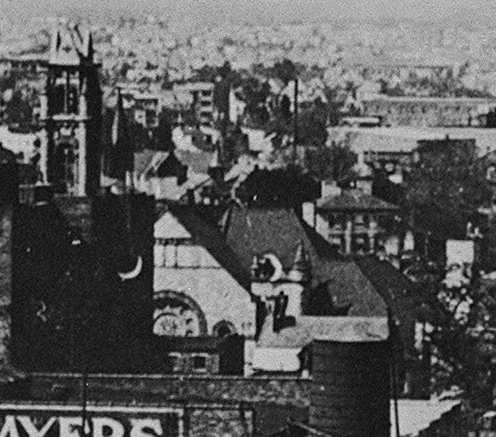 Red ovals, from left to right: The Church which allowed for identification of the photo; two observers on a rooftop; a single observer, and another single observer. Above Left: The Church. Right: the pair of observers. Above Left & Right: the single observers. Do you see it? 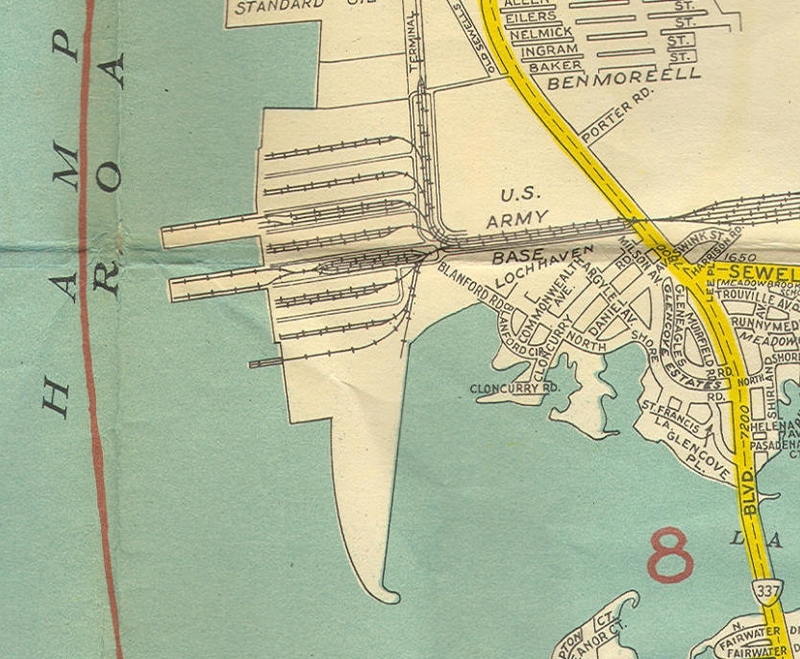 Look back at the 1922 photo of the crash site, at the roads and railroad tracks, then look at the 1940 map again, below, where I have colored-in the road! This is it! Not only do the roads match, but the railroad tracks match (especially the one on which the Roma fell), and the shoreline in the background in the 1922 crash site photo matches the shoreline in the map! Sadly, there is no monument for the Roma and its heroic crew. (This is a travesty). But there is a marker to commemorate the crash! It was terribly difficult to find, but at least 3 web sites I encountered in my research commented that the marker existed, the best of which was HamptonRoads.com (reference already several times above), which, in their June 2010 article in their series "Back in the Day" on the Roma entitled "The Roma Airship Disaster Over Norfolk" (link). 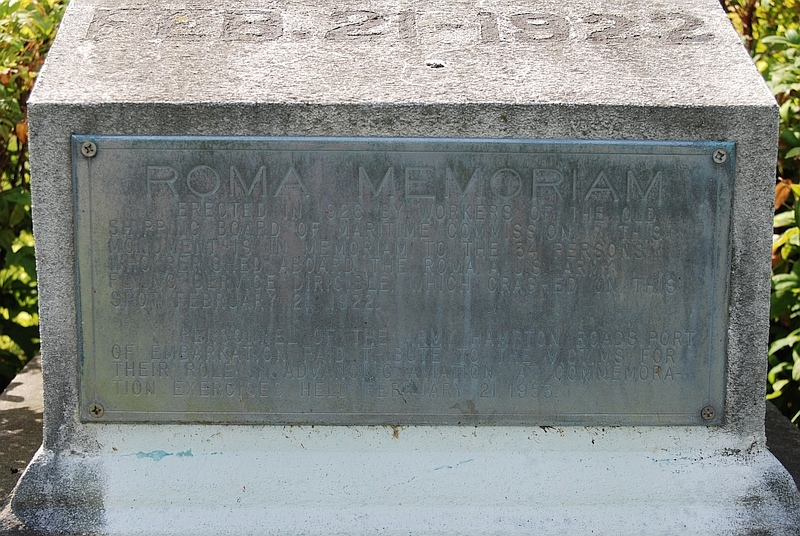 For months, I searched the INTERNET for any other mention of the marker commemorating the Roma disaster, and came up completely dry. 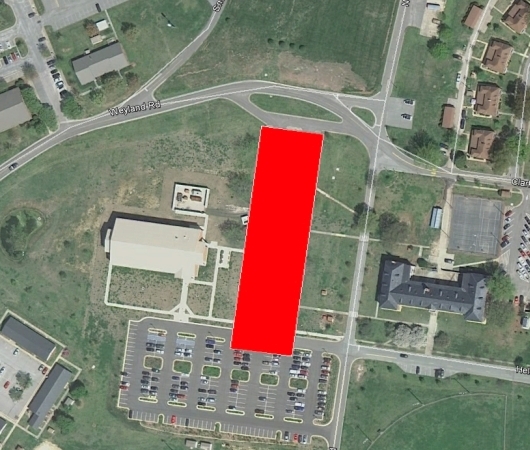 In desperation, I fired off an email to the "contact us" page for HamptonRoads.com requesting assistance in contacting the authors of that 2010 article. To my complete surprise and delight, one of the authors, Jakon Hays, responded, and asked me to call him. Well I did, and in a pleasant and informative conversation, he directed me to the spot while I followed his directions in Google Maps on-line! Erected in 1926 by workers of the old shipping board of Maritime Commission. 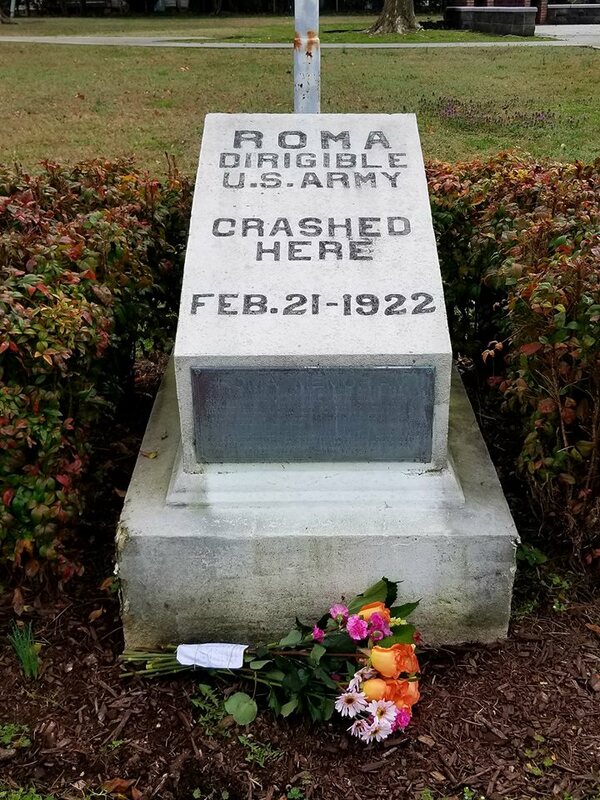 This monument is in memoriam to the 34 persons who perished aboard the Roma, a U.S. Army Flying Service dirigible which crashed on this spot February 21, 1922. Personnel of the Army Hampton Roads Port of Embarkation paid tribute to the victims for their role in advancing aviation at commemoration exercises held February 21, 1953. 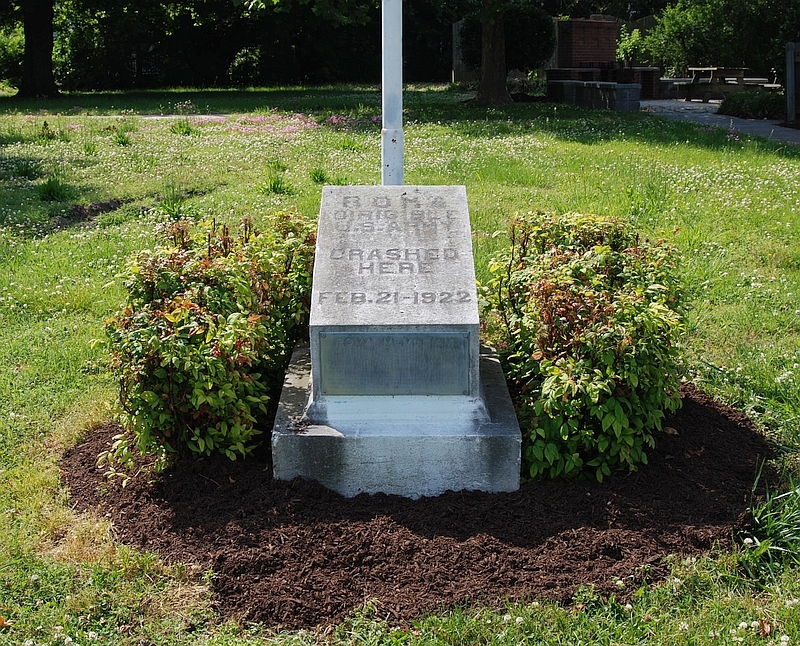 The marker is presently sitting in its THIRD location since it was dedicated in 1926! This tiny memorial does not do justice for the memory of these aviators. May the right people come forward and a proper monument, accessible to the public, be built for the brave souls of the Roma! These US service men deserved better than this.